It may look and sound a little strange having just celebrated Advent and Christmas to find ourselves at a wedding with Mary and Jesus; but here we are! Mary is not only central to Advent and to Christmas, she is central to God’s whole plan for humanity. It is through her faithful ‘Yes’ that Jesus is born. It is when she visits her cousin Elizabeth that Mary breaks into song and proclaims her great prayer, ‘The Magnificat.’ In the gospels we are not actually given a lot of details or information about Mary. We know however that she followed Jesus as he preached and healed people. She was saw him being betrayed, denied, arrested and condemned. She was there at the cross with the other woman when he died. She buried her son and then at Pentecost, she was there when the friends and followers of Jesus were filled with the Holy Spirit. Mary is truly the example of what it means to be a follower of Jesus. She asks us to do what she herself did all her life: she followed her Son faithfully with courage and conviction even when it was difficult and challenging. In the Gospel of Mark, we even read that the family of Jesus came for him because they thought he was out of his mind! Marys’ greatness is that she points and leads us to Jesus through her own word and example. She is not asking us to do anything she has not already done herself. She does not seek or ask for any attention for herself. 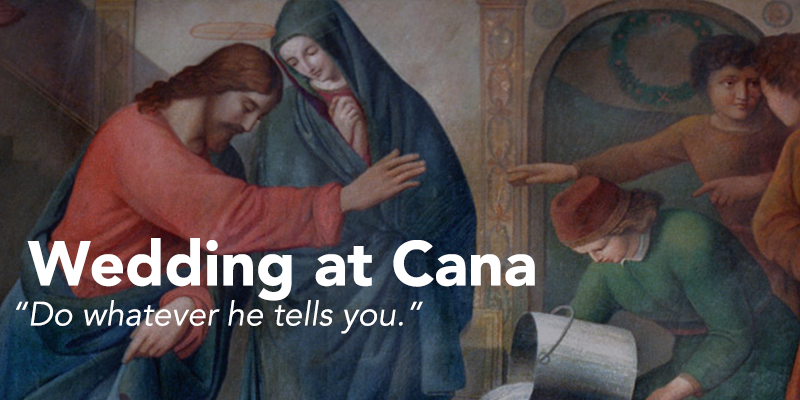 At this family wedding in Cana at which Mary and Jesus were invited guests’, Mary is concerned about the young couple not herself. She knows that soon there will be no wine; and at a Jewish wedding this is a cause of great shame and embarrassment. How did she see and notice that there was no wine? She quietly and without fuss or drama approaches Jesus. What is Jesus asking us to do? He is inviting us to follow him, he is asking us to love each other as he loves us and he is asking us to forgive each other. He is asking us to live like him in our ordinary daily lives; he is asking to reach out and to care for those who are poor, homeless, alone and hungry. He is asking us to be his followers and disciples. How do we do this? By following the example of Mary who did what God asked her to do! Today, may we listen to Mary, and do what Jesus asks each of us to do.